"Magic is misdirection. That's all it is." There are few things inherently more surreal and just plain spooky in entertainment than ventriloquists (or the "vent act," if you want to be up on your insider lingo). In the pecking order, they usually fall below magicians and jugglers, and maybe a slot or two above mimes and clowns, but for pure bizarro-ness it is difficult to top the concept of pretending that a wooden dummy is actually speaking, because it just begs for all sorts of psychological analysis. As an art form, it is a learned skill that some do well and others do sloppily, but what always remains is the underlying thought of what kind of weirdness goes on offstage. Does the vent see his dummy as real? Well, it sure looks that way to the audience most of the time, and that's what creeps us out. Over the years there have been very few "classic" films that have touched on the creepier aspects of ventriloquism, and this 1978 thriller/romance from Richard Attenborough ranks as one of the definitive in the specialized vent genre. But don't confuse a film like Magic with something like Child's Play, for example, in which a doll comes to life and begins murdering people. Attenborough's film, based on the William Goldman book, is hardly a trashy thrill ride akin to the Chucky series, and instead goes directly for that soft part of the brain that considers ventriloquists potentially unstable and perhaps a little dangerous. Corky (Anthony Hopkins) is an introverted hack magician who discovers his true calling as a ventriloquist, partnered with a foul-mouthed dummy named Fats (voiced by Hopkins). This new act�which the screenplay deftly avoids fully explaining the origins of�skyrockets them to great fame, and when his cigar-chewing agent Ben Greene (Burgess Meredith) gets him a television deal with NBC, one of the requirements is that Corky must take a physical. For reasons that should seem immediately very clear, Corky is understandably a bit concerned about being examined by doctors, so he packs up and hides out in a rundown resort in the Catskills. The empty resort is run by Peggy (Ann-Margaret), who was the object of Corky's unspoken love in high school, and who has found herself in an unhappy marriage to the abusive Duke (Ed Lauter). 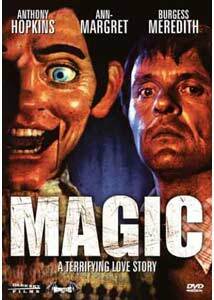 The tagline for Magic is a "a terrifying love story" and as Corky and Peggy begin a romantic relationship, the big-headed spectre of Fats sits like a deadly iceberg as the third part of this odd triangle. As a vent, Corky is clearly one tightly wound chap, and when it's just him and Fats together in their cabin, the conversations flow as if it were two people. Things escalate into arguments quickly as Fats seems to have his own agenda, and in one of the film's strongest moments a heated shouting match between man and dummy is witnessed by Meredith's stunned Ben Greene. This reveal that his client is maybe not quite right in the head leads to a challenge for Corky to not have Fats say anything for five minutes, and it proves to be something damn near impossible to do. Hopkins delivers a sweaty, aggitated bit of acting during this scene that is worth the price of admission. Much has been made over the years about a particularly brief scene in Magic, and the impact that it had on the rest of the narrative. It's a small moment, and naysayers have argued that it ruins the film, but it is a quick visual that lends itself to both logical and supernatural conclusions. The unnerving part, from a viewer perspective, is that the character of Fats somehow becomes real in our eyes, and Attenborough frames shots so that we are constantly drawn to the dummy, as if waiting for a reaction, such as an eyebrow twitch. It's a subtle effect, but it says something about the power of the performance by Hopkins, who imbues a wooden caricature of himself with an unspoken presence, even when Fats is completely motionless. Image Transfer Review: The 1.85:1 anamorphic widescreen transfer comes from the 35mm original negative, and according to the liner notes was supervised by Magic cinematographer Victor J. Kemper. Anyone who has only seen the horrendous videotape version of this film will no be doubt floored by the improvement here, primarily in the representation of blacks, which prior to this DVD had always taken on an impenetrable mass of nothingness. Colors, too, take on a new vibrance, and elements like the red of Ann-Margaret's hair or the paintjob on Fat's head look sharper than they ever have. A bit of fine grain and a couple of extremely minor bits of debris, but otherwise a well-done and long overdue anamorphic widescreen transfer. Audio Transfer Review: Audio is provided in 2.0 Dolby Digital mono. Overall a rather flat presentation, but voice quality is clear, though it does clip in a few spots; the lack of dynamic range limits sort of mutes the effect of the Jerry Goldsmith score. A couple of very noticeable overdubs are rather jarring, so perhaps that's a reflection of the clarity of the mix. Extras Review: Sadly, there's no commentary here, but in its place is a new anamorphic widescreen doc, Fats and Friends (26m:53s), featuring Dennis Alwood, the ventriloquist consultant on Magic. Alwood provides an interesting history of ventriloquism and then moves into a series of behind-the-scenes tales from the production, including original cast choices of Jack Nicholson and Laurence Olivier, and the disturbing thought that Chevy Chase was once considered for the Hopkins role. In a bizarre bit of life imitating art, Fats appears here too, offering comments on his own special remembrances of the film. An Interview with Victor J. Kemper (12m:17s) features the cinematographer talking about the role of the D.P. in general before branching into some Magic-specific stories, such as what it took to get the reflecting light of the lake just right. Anthony Hopkins Radio Interview (03m:20s) is played over some behind-the-scenes footage, and most of it concerns how he got his start in acting, while An Interview with Anthony Hopkins (06m:15s) is a grainy 1978 Spanish television interview. The Ann-Margaret Makeup Test (01m:19s) has no audio, but is curiously presented in anamorphic widescreen, and is essentially 80 seconds of her shaking her hair and looking absolutely radiant. The extras conclude with a grainy print of the "tell yourself it's only a movie" theatrical trailer, a set of four television spots (two English, two Spanish), a trio of radio spots (two English, one Spanish) and a photo gallery of international poster art and publicity stills. The disc is cut into 13 chapters, with optional English subs. Here's another title that can be checked off my DVD wish list, and though it has been a long time coming, Dark Sky has come through with a great-looking anamorphic widescreen transfer for this one. The film itself holds up well in terms of mood and suspense, it is effectively eerie and disturbing, and is buoyed by a frazzled performance from Anthony Hopkins as one half of a creepy whole.